Editor’s note: This story was produced by Ensia in collaboration with the Food & Environment Reporting Network, a non-profit investigative news organization. Harlon Pearce walks muck-booted past processors gutting wild drum and red snapper to showcase a half-full new 5,000-square-foot freezer he hopes someday will house a fresh boom of marine fish. Harlon’s LA Fish sits just across the railroad tracks from the Louis Armstrong New Orleans International Airport, perfectly positioned to ship fish out of Louisiana. The Gulf of Mexico annually yields a catch of about 32,000 tons of wild-caught finfish, which are bony fish such as snapper or grouper. Given regional demand, Pearce said, "our wild marine fish don’t go too far." To his point, a seafood restaurant is on practically every block of New Orleans' French Quarter. Around 180 million tons of fish — wild, farmed, marine and freshwater — are produced globally to satisfy annual demand. The World Bank predicts (PDF) that by 2030, two-thirds of fish being consumed will be farmed. Which is why Pearce and others believe the U.S. should be farming fish in its open waters. Producing more of our seafood in the U.S. means that consumers will have local, safe, sustainable choices, explained Michael Rubino, director of the Washington, D.C.–based Office of Aquaculture at the National Oceanic and Atmospheric Administration Office of Fisheries, when he announced a federally approved plan taking shape in the Gulf of Mexico. The gulf, by volume, is second only to Alaska in terms of U.S. wild-catch fisheries. In January 2016, NOAA authorized up to 20 open-ocean aquaculture permits for the gulf. In total, these could produce 32,000 tons of fish — effectively doubling the amount of finfish coming out of the area. (A draft environmental impact statement that would help guide offshore aquaculture development in Hawaii is expected later this year, and public hearings this summer will decide the fate of a proposed finfish farm 8 miles off the coast of Hampton Bays, New York). Marine aquaculture, so far largely based in coastal waters, long has been anathema to environmentalists, its reputation blighted by everything from pollution and disease outbreaks to the destruction of mangroves and genetic contamination from escaped fish. Open-ocean aquaculture could reduce some of these environmental concerns, assuming it is sited in deep, swift waters, reducing the potential for pollution and disease without destroying habitat, and remaining challenges, such as fish escaping and forage fish being used as feed in huge quantities, have promising fixes. As a result, some environmentalists are saying open-ocean aquaculture deserves a fresh look. As all food we grow, on land or in the sea, has some environmental impact, isn’t aquaculture worth exploring if it can satisfy rising demand for healthier protein with less impact than, say, beef or pigs? Given the idealized small, local, low-input view of sustainable farming, offshore aquaculture presents something of a paradox. On one hand, U.S. fish farms would be local and more heavily regulated than some farms producing imports. On the other, to be economically viable, operations would need to be industrial-scale. "There will be costs to the wallet and environment. It’s unavoidable. But if done correctly, environmental costs will be negligible," said Greg Lutz, an aquaculture specialist with the Louisiana State University Aquaculture Research Station, based in Baton Rouge. "As a society, we have to decide what impacts are acceptable. There’s no free lunch." Open Blue, the largest open ocean fish farm in the world, 8 miles off the coast of Panama, is a good place to look when addressing the idea of scale and sustainability. Owner Brian O’Hanlon and his investors chose to stock cobia for three primary reasons: it would avoid direct competition with wild fishing; it would offer versatility to chefs; and it would appeal to health-conscious consumers. Tenney Flynn, co-owner and award-winning chef at GW Fins in New Orleans, prefers his cobia spearfished, but sees aquaculture as inevitable in the U.S. "There’s too many people in the world and fish is too popular," he said. If he does buy farmed cobia, he prefers the quality out of Central America compared with Vietnam. A local option would offer an incentive, however. "The expense with aquaculture is the freight. If you can take freight out of the equation, it knocks off $2 per pound," he said. Local fish are already Flynn’s preference: His menu in February listed 12 finfish, of which roughly 70 percent were local and wild. The World Bank predicts that by 2030, two-thirds of fish being consumed will be farmed. There are signs that operations such as Open Blue can be sustainable. O’Hanlon gave then-University of Miami Ph.D. student Aaron Welch, studying the environmental impacts of aquaculture, the run of the farm during 2012–13 to collect environmental data as long as he shared it with O’Hanlon. One concern with offshore farms is that concentrated waste from these operations, either in the water or underlying sediment, adversely could affect ecosystems — at worst, resulting in eutrophication or fish mortality. According to Welch, the open-ocean cage operation left no nutrient footprint (PDF) in the water column, either from dissolved oxygen or nitrogen compounds. He did find a modest uptick of organic carbon and nitrogen compounds in the sediment around the cages. Extrapolating published data to calculate a maximum amount of fish poop [4,400 tons of nitrogen compounds for each 32,000 tons of fish produced] from the federally approved Gulf Coast operations effectively would be a drop in the bucket (and, Lutz said, a "worst-case scenario" given the methods used in the paper) compared with what already gets dumped into the gulf from Midwest farm chemicals via the Mississippi River. 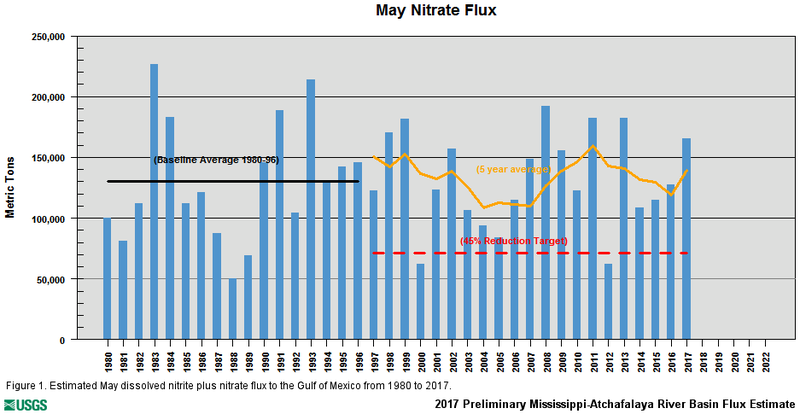 In May 2016, the gulf’s estimated input of nitrites and nitrates was 165,000 tons. Another potential sustainability issue, antibiotic use — overuse can lead to bacteria resistant to antibiotics — has declined. Vaccines largely has supplanted antibiotic use, at least in Europe and the Americas, and antibiotics are more heavily regulated in aquaculture than in any other kind of animal production, said Neil Sims, co-founder of Kampachi Farms, a research facility in Kona, Hawaii, who is planning a commercial offshore operation 4 miles offshore from Bahia de La Paz, Mexico, to grow a sashimi-grade Almaco jack. He and colleagues also have experimented with untethered open ocean drifter pens and unmanned net-pen operations off the Hawaii coast. He laments the slow pace of the U.S. government actions to streamline the regulatory landscape. "The logic of not doing [open-ocean aquaculture in the U.S.] escapes me," said Albert "Rusty" Gaudé, a fishery extension agent based in Jefferson, Louisiana, with the Louisiana Sea Grant program, one of 33 NOAA-funded state college research programs focused on long-term economic development and environmental stewardship. "I can’t think of any large-scale animal-production scheme that has been looked at as much as this has been. Cattle feedlots certainly weren’t." Existing data indicate that marine fish farms are far more efficient and pollute less than cattle or pig farms. Based on Conservation International’s 2011 "Blue Frontiers" report (PDF), said Jack Kittinger, senior director of Conservation International’s global fisheries and aquaculture program, based in Honolulu, Hawaii, "offshore aquaculture looks a lot more sustainable than other animal production methods, which was eye-opening for us." If we put all the options on the same table and compare everything in terms of nutritional value and environmental impacts, open ocean aquaculture looks very promising, said Ben Halpern, director of the University of California, Santa Barbara–based National Center for Ecological Analysis and Synthesis. Marine ecologist Steve Gaines, dean of the Bren School of Environmental Science and Management at UCSB, was stunned by what he and colleagues found while comparing available data on the greenhouse-gas footprint of animal production methods. Finfish and shellfish aquaculture had a much lower GHG footprint than anything land-based (and shellfish aquaculture could even reduce nutrient pollution, something that could be useful in the Gulf of Mexico). "Producing all of our future animal protein needs via beef adds [the equivalent of emissions from] another United States, whereas if we produced the same amount of shellfish protein, we would only add another Texas," he said. The main reason is that shellfish, filter feeders, do not require a food supply; they thrive on the copious nutrients already in the water. Aquaculture — specifically operations that use best practices, Gaines clarified — offers great opportunities to meet future food demands. One strong argument in favor of ramping up open-ocean aquaculture in the U.S. is that the country imports 90 percent of its seafood, and half of that is farm-raised overseas in operations that can have dubious internal levels of food-safety and environmental oversight. According to the U.S. Food and Drug Administration, the top seven countries that export aquaculture-raised seafood to the U.S. are Canada, Chile, Ecuador, India, Indonesia, Vietnam and China, which led global aquaculture production with 76 million tons produced in 2016. Because the FDA can’t physically screen all seafood imports, it monitors whether foreign suppliers comply with U.S. food-safety laws and uses a program called PREDICT to identify higher-risk shipments for physical examination. Increasingly, global operations are moving into open ocean waters — except in the U.S., where stiff regulatory hurdles so far have made it difficult for investors in, for example, southern California to get approval for operations. NOAA’s gulf ruling was not without controversy. The day it went into effect, 11 groups — from associations of commercial and recreational fishers to local and national environmental organizations — filed a joint lawsuit challenging NOAA’s authority to permit industrial aquaculture offshore. The lawsuit alleges that NOAA’s authority under the 2007 Magnuson-Stevens Act, the primary law governing marine fisheries management in federal waters, is only to regulate wild fisheries catches, not industrial aquaculture operations. In essence, the plaintiffs’ legal argument is that this is farming, not fishing. "Fishermen are concerned about keeping the gulf safe and productive in light of the scale of aquaculture being proposed," said Will Ward, the attorney representing fisheries plaintiffs in the lawsuit and a former fisherman. "They are the ambassadors for wild fish stocks." One concern is the threat of escaped fish, but improved netting reduces the likelihood this will happen. In the gulf, only native fish can be farmed under NOAA’s new permitting rules. Yet several studies have shown that hatchery rearing, even a single generation, can alter fish genetics — specifically, survival and reproductive success. While a few escapees likely would live long enough to mate and spread their genes, most likely would end up as prey, said Patrick Banks, assistant secretary of the Office of Fisheries at the Louisiana Department of Wildlife and Fisheries. Still, said Ward, "[commercial and recreational fishing] is a multibillion-dollar industry we’re talking about. If something goes wrong, the citizens of the Gulf Coast are the ones left holding the bag." One often-cited advantage to the oil-rich gulf over other potential regions in the U.S. is infrastructure. "The Gulf of Mexico is a natural place for aquaculture to start [in the U.S.]," said Gulf Seafood Institute’s Pearce. "Everything is here shoreside. We’ve got vessels, processing facilities, and we shouldn’t waste these oil platforms." He’s referring to the 2,110 oil platforms spread throughout gulf waters; over 600 are waiting to be decommissioned. Oil platforms could serve as aquatic barns, storing fish feed and pen equipment, which would reduce start-up costs. But the gulf also presents formidable challenges. The region is still recovering from the 2010 BP Deepwater Horizon oil spill. The oil rigs share the waters with heavy marine traffic. A large portion of the gulf suffers from an annual hypoxic or "dead" zone resulting from the agrochemicals draining into it from the Mississippi River. And the region is vulnerable to increasingly severe hurricanes, although submersible pens exist that can be lowered to avoid a storm’s destructive wave energy. Buddy Guindon is executive director of the Gulf of Mexico Reef Fish Shareholders Alliance, a non-profit that represents commercial fishermen interests. He fishes the waters near Galveston, Texas, where the organization is based. These waters are shallow and so likely won't be directly affected by offshore aquaculture operations, ideally located in deep, swift-moving water. Still, he explained that the gulf is essentially a semi-closed body of water dominated by a northward-flowing loop current of warm water from the Caribbean. "We’re concerned about the [fish farm] effluent, the waste," he said. Regional fishermen aren’t just concerned about what goes into the water, though. What comes out is raising questions, too. Currently, 20 million tons of wild fish — one-quarter of the world’s commercial catch — is turned into fishmeal. Greater regional demand for fishmeal production, they worry, could leave fewer forage fish for the wild species, given that a sizable chunk of gulf menhaden — a small, oily forage fish — is already turned into fishmeal for aquaculture elsewhere. In May 2015, Empire, Louisiana-based Daybrook Fisheries, the second-biggest U.S. processor of menhaden, was sold for $380 million to Oceana, a South African fishing business that supplies fishmeal around the world. But new sources of fishmeal — from soy to insect larvae to seaweed — promise to alleviate the demand for forage fish. "The frontier [on aquaculture feeds] is lowering the environmental footprint entirely," said Conservation International’s Kittinger. He said this will include converting vegetable matter and even food waste streams into feed. Still, the debate over aquaculture simmered in the hallways outside the fishery council meeting in January, where fishermen’s organizations discussed whether they should remain part of the lawsuit against NOAA’s new permitting proposal. In the end, Guindon said, the Shareholders Alliance and the Charter Fishermen’s Association grew leery of appearing anti-aquaculture, and opted to leave the lawsuit in February. Guindon said fishermen would favor a "slow ramping up of aquaculture if there were heavy requirements for third-party monitoring of any harm that might be occurring and the regulatory authority to cease actions." But trust in that regulatory authority is a big issue in the Gulf of Mexico. Just blocks away from the meeting, Cynthia Sarthou sighed and shook her head. It may be cynical, said the executive director of the Gulf Restoration Network, an oil-industry watchdog in the region and a remaining participant in the lawsuit, but she has little confidence that federal agencies, especially promoters of an industry, will fully enforce regulations. NOAA, for example, is housed in the U.S. Department of Commerce. "I have never seen a situation where regulatory agencies in the gulf are fully able to implement regulations and safeguard the environment, especially when economic interests are involved," she said. She blamed a lack of funding and political pressure. "Agencies are subject to political pressure, politicians answer to people who invest in campaigns and industry invests in campaigns," she said. And while NOAA may mean well, she said, it is one of the weakest regulatory bodies in the region. She points to countries such as Norway as admirable regulators of industry. "If we had the environmental ethic of Norway, I would be much more comfortable with this," she added. It’s unclear how offshore aquaculture will be perceived by the Trump administration. Wilbur Ross, the new head of the U.S. Department of Commerce, said in his January Congressional confirmation hearing that he would like to see the U.S. become a net exporter of fish. Yet the administration’s newly proposed budget includes drastic cuts to federal agencies, including NOAA and the Coast Guard. It’s too early to tell what that will mean for regulatory oversight. Supporters of offshore aquaculture argue that current U.S. regulations are unnecessarily cumbersome. A new memorandum of understanding details the seven government agencies that will be involved in permitting offshore aquaculture in the Gulf of Mexico. NOAA Fisheries Southeast Regional Office, the lead agency, will issue permits to deploy operations offshore and sell the harvest. A pollution discharge permit will need to be secured from the Environmental Protection Agency, while the Army Corps of Engineers will regulate the placement of structures or modification of navigable waterways. The Bureau of Ocean Energy Management, Bureau of Safety and Environment Enforcement, Fish and Wildlife Service and Coast Guard also will review operations. Advocates such as Gulf Seafood Institute’s Pearce believe aquaculture will bring economic benefits to coastal communities, at least between southern Louisiana and the Florida panhandle, which are closest to the deep, rapid-moving waters where offshore fish farms would need to be placed. These communities have been hard hit in recent years from human-caused and natural disasters. For example, Hurricane Isaac struck Venice, Louisiana, in 2012, two years after the fishing community was devastated by the Deepwater Horizon oil spill that occurred only 50 miles to the southeast. The commercial fishing industry lost millions of dollars in sales and thousands of jobs in the first eight months after the oil spill, according to one study (PDF). But many in these coastal communities don’t expect aquaculture to bring them anything but headaches. With this much risk and money at stake, aquaculture investors have little incentive to employ local fishermen, processors or dock handlers, predicted Margaret Curole, Gulf Coast native and a founding member of the Commercial Fishermen of America, an advocacy group. Rather, aquaculture fish could be transported up the Mississippi River directly to New Orleans suppliers, bypassing fishing communities all together. Catch shares — allotted fish quotas allowed given total catch limits, which can be sold among fishermen — already proved unprofitable for a number of the smaller fishing operations, forcing them out of business. And Venice-based shrimpers, who struggle to compete with massive farmed imports from overseas, offer an example of how farmed seafood affects global markets. Now fin fishermen are nervous about competition, too. Pearce hears such economic concerns often, but is convinced the opposite is more likely. "Aquaculture creates markets," he insisted. He said farmed Atlantic salmon is the perfect example. It makes seafood affordable for the masses, while wild-caught salmon garners a premium price for people willing to pay. In the gulf, offshore aquaculture operations likely would focus on high-value species that don’t make up much of current catches. Only a few high-value native species would make economic sense — and fewer still have developed successful hatchery production, such as cobia, pompano and red drum, said Rex Caffey, a natural resource economist based in Baton Rouge with the Louisiana State University Agricultural Center and Louisiana Sea Grant. Cobia is an aquaculture favorite because of its remarkable growth rate, but that might bring problems of its own. "A tsunami of cobia is coming at us" from around the world, which could flood the market and cause prices to plummet, said Louisiana Sea Grant’s Gaudé. The biggest unknown, said Caffey, is whether offshore fish farms could survive economically in the gulf given the daunting infrastructure costs, labor, transport, liability concerns and environmental constraints. Investors may eye existing oil platforms, but their use is not without significant costs. Matt McCarroll, president and CEO of Fieldwood Energy, LLC, in Houston, said his company is the largest owner of offshore platforms in the U.S. and actively has been decommissioning them in recent years. He said he’s been contacted five or six times in the past 10 years by potential aquaculture investors interested in using the platforms. But the conversations end, he said, as soon as he explains that it will cost $2 million to $10 million, depending on size and water depth, to take over maintenance, liability and responsibility for decommissioning the platforms. Perhaps the biggest limitation in the gulf is that, under the NOAA provisions, no single operation would be allowed to produce more than 6,400 tons, or 20 percent of the gulf maximum limit of 32,000 tons. "That’s laughable — the size of a modest Norwegian fish farm," said Kampachi Farms’ Sims. "Especially when you look at the moral imperative to grow more of our own seafood." The economics of aquaculture always have been risky — with significant up-front cost and a lengthy time to recoup investment. Louisiana State University’s Lutz told an old joke among fish farmers: "If you want to make a small fortune in aquaculture, start with a large fortune." "These operations only get efficient with scale; they require a large investment and a viable permit pathway in U.S. waters. That’s why people aren’t running" to apply for permits in the gulf, said Sims. And, he added, that’s why operations that could have been in the U.S. end up in places such as Panama, where Open Blue is, and Mexico and Costa Rica, where open-ocean aquaculture is already up and running. Offshore aquaculture offers a glimpse of the kind of difficult food-security decisions societies will grapple with going forward — knowingly facing and mitigating the unavoidable consequences of producing the food we eat. "As populations continue to grow, we won’t be fighting over oil and gas, but over freshwater and food," said Robert Orr, managing director of Cuna del Mar, a private equity fund that invests in sustainable aquaculture companies, including Open Blue. Conservation International soft-launched a program in January called Blue Production with the aim of shaping and spreading best practices throughout the aquaculture industry. "Aquaculture is only going to grow, so how can we steer it in the right direction?" asked Conservation International’s Kittinger.